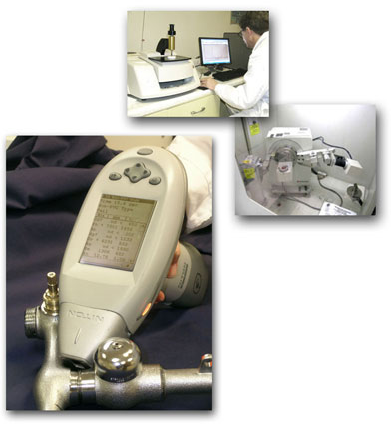 XRF is a non-destructive method of performing semi-quantitative analysis of most metals and alloys. By bombarding a material with x-rays, the unique wavelength energy of each element is identified and recorded by the instrument allowing us to identify most materials non-destructively. Our Niton XRF analyzer is ideally suited for material identification, material verification of components, and heavy metals in plastics such as toy testing and reaction of hazardous substances (RoHS) testing. The portability of our unit allows us to perform on-site testing of base materials and weld metals without threat to the structural integrity of a part which typically occurs in a conventional compositional analysis. Lehigh Testing Laboratories, Inc. (LTL) in New Castle, Delaware, is a DEA-registered laboratory registered for Schedule 2, 2N, 3, 3N, 4, and 5 controlled substances. We are licensed by the State of Delaware and the US Department of Justice DEA. Our analysis and testing services have been expanded for the pharmaceutical industry. This registration provides us with the approval to conduct testing and analysis, as well as providing assistance with R & D, on Schedule 2 through Schedule 5 controlled substances. If your company has a need for detection of heavy metals, contaminants, etc., we can help using ICP, SEM/EDS, FTIR, and other methods. Be aware, USP 232 and 233 are looming. Product verification is another area where LTL has the capability of helping you. We have X-Ray Diffraction (XRD) services on site for compound analysis and verification.